It's been awhile since I talked about my fitness routine so today, I wanted to share with you guys a couple of things. A few months after Madelyn is born, I started squeezing a 30-minute workout during my lunch break. It wasn't easy but that was the only way I can get my workout done. I kept up with it for 3 months before calling it quits for a couple of reasons. Reason # 1: When temp rises outside, it takes me a good hour to cool down after my workout. Being hot and sweaty at work is not exact what I want to deal with everyday. Reason # 2: As suggested, you should wait 1-2 hours after eating to exercise. I usually have lunch around 11:30 and start my running at noon. 30 minutes does not give my stomach enough time for digestion. Because of that, I often got cramps. To resolve both issues, I started running early in the morning. I get up at 5:30 AM and start running with a friend of mine. Having a running partner makes working out more enjoyable. The early morning run is so peaceful. There are many benefits to getting your run in early. For me, the biggest thing is the feeling that I've accomplished something first thing in the morning before most people are awake. I am usually done with my workout by 6:45 AM. By doing so, I don't have to worry about fitting a run into my day. I also find running on an empty stomach to be the most comfortable. Exercising on an empty stomach also forces the body to tap into its reserves. Hence, providing a more efficient workout. 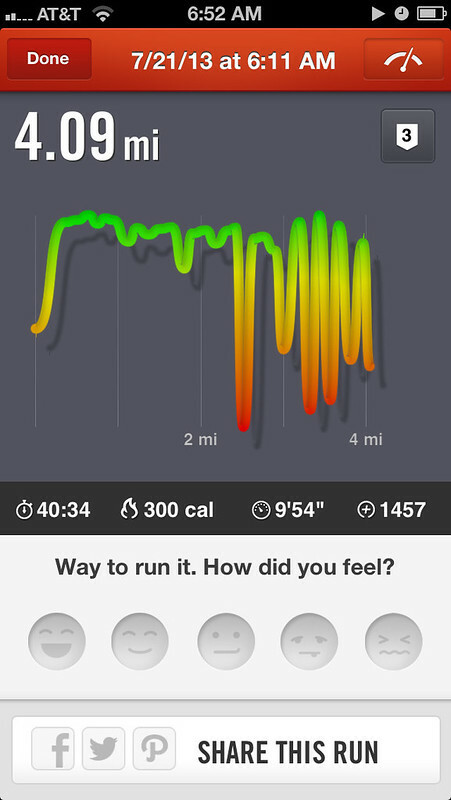 I use Nike Running app to keep track of my runs and am loving it. My goal is to run 4 days during the week (approximately 4 miles a day) and do other cardio workouts on the weekend. Of course, eating healthy and exercising go hand-in-hand. I have recently adopted a few healthy eating habits as well and will share with you guys in a later post. Great job :) You look great post baby!! I need to continue running too! I use to run after work, but ever since summer hit, I started running in the morning as well, I read in the Fitness magazine, that is also the best time to run since it's the coolest time of the day, and it feels so much better even though that means I'll have to wake up extra early. I workout partner is th best! Glad you found something that works for you! I use this Nike app to keep track of what I burn when I walk my dog too! I run too. Glad we have more in common. But I do not have that app. Will need to check it out. 4 mi is actually a lot for a new mom - good job! This is very great thing you have shared with us. Now I found enough resources by your tips about this issue.